Suitability: SQL Server is known for its easy-to-use, simplified enterprise DBMS and for delivering the best price-performance for most business applications. Many enterprises like the breadth and depth of the packaged applications SQL Server supports across various industries. 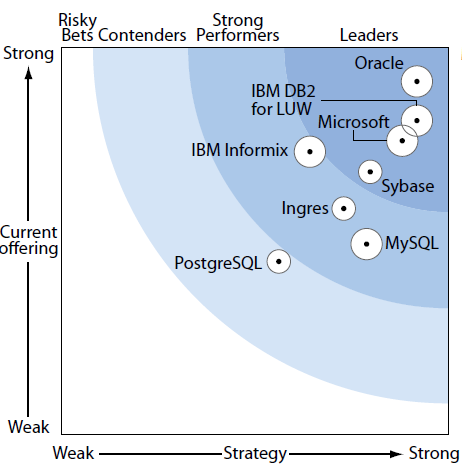 In addition, SQL Server 2008 offers strong support for unstructured and semistructured data. Enterprises that want a cost-effective and easy-to-use enterprise DBMS should look at SQL Server. Issues: Although SQL Server lags in distributed caching and scale-out architectures, Microsoft is adding such features in future releases. For example, “Velocity” is a distributed caching technology that supports high-volume transactions.